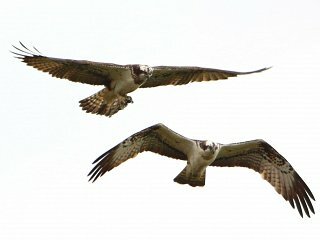 Branson, the male Osprey has as predicted been joined by his partner Libby at Lochter Fishery in Oldmeldrum. No doubt suitably impressed by his spring cleaning and general repairs to the nest, she has settled in and the pair are busy each day raiding the larder of fine plump stocked rainbow trout. They have however left plenty of trout for us human fishers to land as can be seen in the catch record. Lochter regular Peter Young had his best day ever with thirty-four fish to his name. He started with yellow dancers and switched to okay dokeys when the takes dried up. Also having an exceptional day was Jimmy Rhind who kept three and returned around forty using a mix of buzzers and bloodworms. The McLeans, James and Craig had over fifty between them using a selection of nymphs and lures. There were lots of bags of sixes and sevens mainly from buzzers and quite a few in double figures including Steve Prince with fourteen, R. Bell with twelve, Graham Duthie with twelve, Simon Ruddiman fifteen including several on dries and Scott Inglis with ten. Finally a reminder that the Spring Singles event is scheduled for Sunday 24th April at 9.30, lunch will be included and there are plenty of prizes up for grabs.